As spectacular as the nectarine sorbet at Coppa was, we definitely needed a solid dessert course to round out the night. Anita and Alex are big fans of the bar at Sibling Rivalry, so we headed one block north of Coppa for drinks and dessert. The horseshoe-shaped bar is accommodating for groups of people and occupies its own distinct space apart from the main restaurant. Full-sized windows curve around mirroring the shape of the bar and provide views out onto Tremont Street. Banana Coconut Tart chocolate ripple ice cream, espresso chocolate sauce and butter toffee. This was my favorite of the bunch. 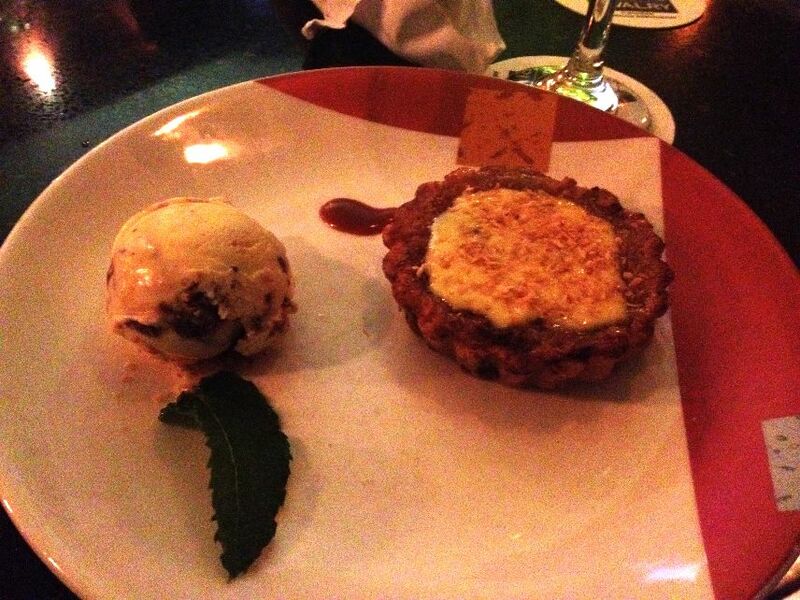 The soft tart shell held a warm, rich banana filling, topped with a creme anglais and toasted coconut. The tart and creme anglais stood well enough on its own, but the straciatella ice cream was a lovely pairing with both the warm banana and the coconut flavor. 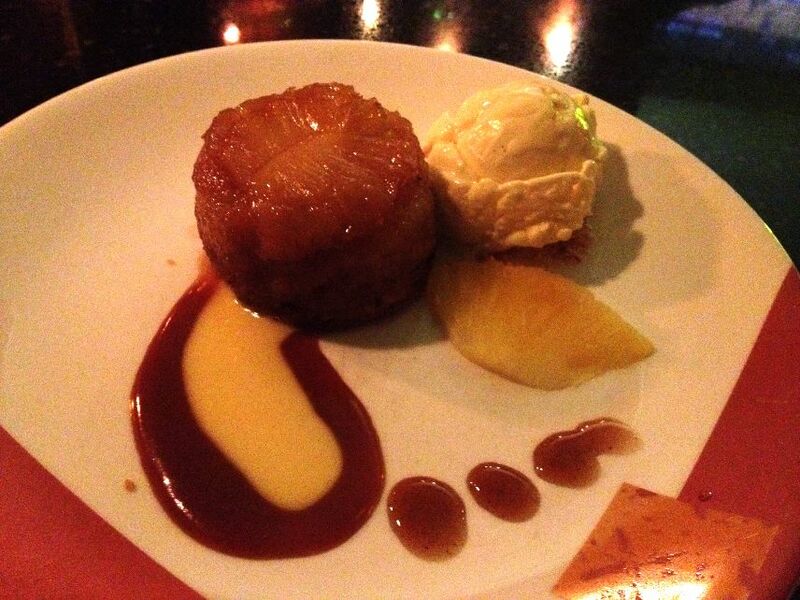 Pineapple Upsidedown Cake rum toffee Sauce, clove gelee and vanilla ice cream. I love pineapple upside down cake and this one did not disappoint. A moist and buttery round of cake topped with caramelized pineapple and soaked through with toffee sauce. The vanilla ice cream was the perfect cold and creamy accompaniment to the warm and sticky cake. 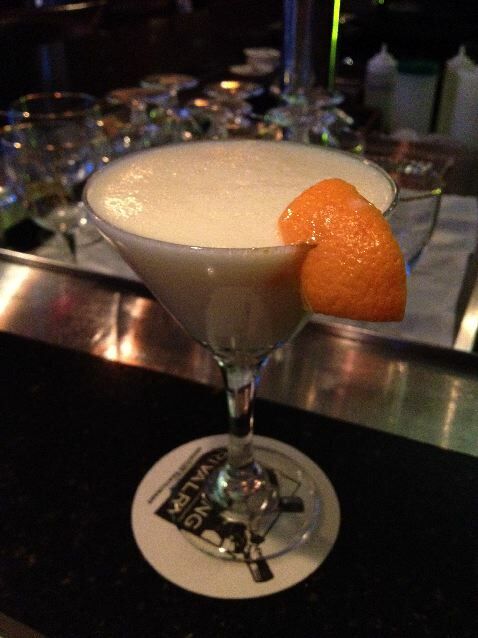 Creamsicle cocktail A perfect dessert cocktail. Nice orange and cream flavor but not too sweet. White Chocolate Bavarian dark chocolate base, chocolate sauce and drunken cherries. I wasn’t really a fan of the second two desserts. This one had a bit too much of a gelatinous texture for me and was fairly tasteless. Coffee Crème Brulée with pistachio biscotti. I found both the flavor and consistency off on this one. 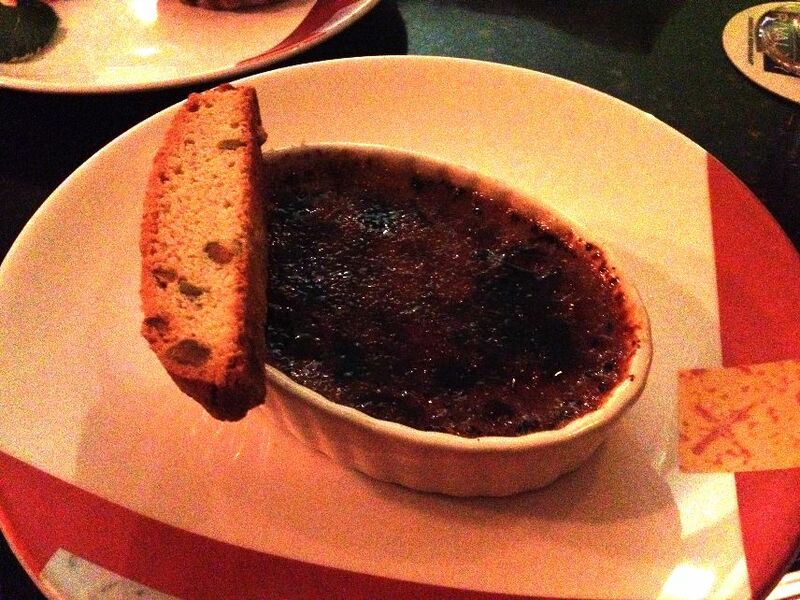 It was thick and heavy, not much like the eggy custard that normally comprises a creme brulee. The topping veered more towards burnt than pleasantly caramelized. Sibling Rivalry’s desserts didn’t blow me away by any means, but I thoroughly enjoyed the banana tart and pineapple cake and they made for a satisfying sweet finish to the evening.I would be interested to someday try them out for dinner. It’s a fun and unique concept and I’ve heard good reviews from people who have been. 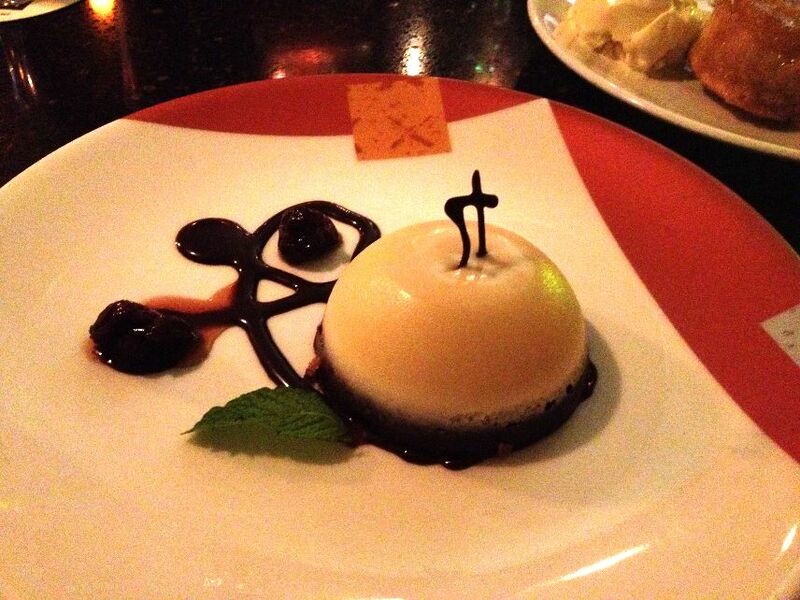 This entry was posted in Boston, Reviews and tagged Boston, Cake, dessert, Ice cream, Reviews. Bookmark the permalink. I’ve heard a lot of mixed reviews for this spot, actually! I still have not been here. Too bad the last two desserts didn’t work out that well. I’ve had so-so experiences here, too. I never would have thought to order the coconut or pineapple items but good to know they are solid! I didn’t realize Sibling had so many different desserts. Looks like a nice variety. Sounds like a fun bar to hang out at, at least, and that banana coconut tart sounds great! 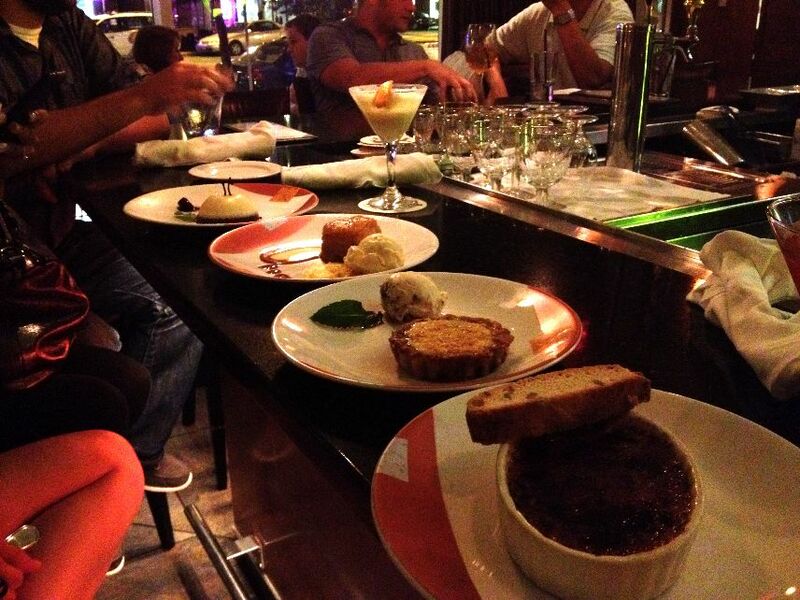 I’ve been meaning to check them out for dinner – they seem to have some creative flavors and I like the unique menu concept – but it also sounds good just for a late-night dessert and drink. The Pineapple Upsidedown Cake looks amazing!